Setting debug=1 in conf.ini allows more output to the error log, which can be invaluable for tracing down blank white screen issues. The firs for the problem "Application Loads But All images and styles are missing" doesn't work. I edited the index.php file as like was suggested, the path to the xataface was incorrect. I re-applied read-write permissions to the entire xataface directory on my server, I re-applied read-write permissions to the entire application directory, I shutdown Apache and restarted it, it still shows the page missing all pictures and, obviously, not loading the CSS to display it neatly. Something is broken. Had the same issues. Tried almost all possible path variations. The permissions of my xataface directory have been set to '744'. Changing the permissions to '755' solved the problem. I think I'm doing something basically dumb, but have no idea what. Good night's sleep. Kept looking and found stuff that worked, seems I was missing a templates_c folder. 1. These are deprecation warnings and can be disabled. 3. What version of Xataface are you using? I think the smarty deprecated error is fixed in the latest in git. I'm using 2.0.3, and thanks for the deprecation solution pointer, it worked and I learned. The window opens with TWO html "pages", and checking the source, the code is duplicated. Have I managed to build in recursion? Are you calling "display()" twice in your index.php file? "As of Xataface 1.3 all applications are now required to have its own templates_c directory to house its compiled templates. Please create the directory "/Applications/XAMPP/xamppfiles/htdocs/FacultyOfWidgetry/templates_c" and ensure that it is writable by the web server." I created the directory already but it is empty, so what do I include in there? You don't need to put anything in it. It just needs to be there and be writable by the web server. Xataface will save compiled smarty templates in it. Can I ask how do I create the directory? Is it just a folder? Thanks, it finally loaded, but I am missing the images, I have the xataface folder in my htdocs folder of XAMPP, and my directory is /Applications/XAMPP/xamppfiles/htdocs/xataface/, I am using mac btw. Why is it not working? It's me again, I tested everything on a windows laptop and I get the same problem, style and photos not loaded, may I know what have I done wrongly? I get a vary basic interface that gives me access to my database. It is not very user friendly and looks nothing like the examples in the tutorial. Also, when I add new entries two fields do not update but remain blank. Some tutorials were written with the old look and feel. You can revert to the old look and feel by adding disable_g2=1 to the beginning of the conf.ini file. No special characters. I had problems with the database not having a primary field. All fields were text. I change one to Varchars which fixed the primary field problem. Then I noticed data enter in this field would not end up in the database. I tried Tinyext and Mediumtext, no luck. Added a datestamp field as primary and back to all other fields being text but they still the 2 fields don't seem to receive data. I can insert data using phpmyadmin, Refreshed Xataface. No luck. it turns out that there is a 3rd field not often used that can't be filled in also. All tree fields were ones I had set to Varchars or Tinytext etc at some stage. The 2 fields that do accept data have been Text all the time. If data is entered via phpmyadmin it is visible in Xataface. Does Xataface have some configuration that it read from the earlier data base structure that I should edit now? FYI, all I want is ADD, EDIT, DELETE & SEARCH dialogue for the interface, It is a simple requirement. I put disable_g2=1 at the beginning of the conf.ini file. I got the same effective interface, but in text only form, Looks like something from the 90's :). 1. Check your php error log. 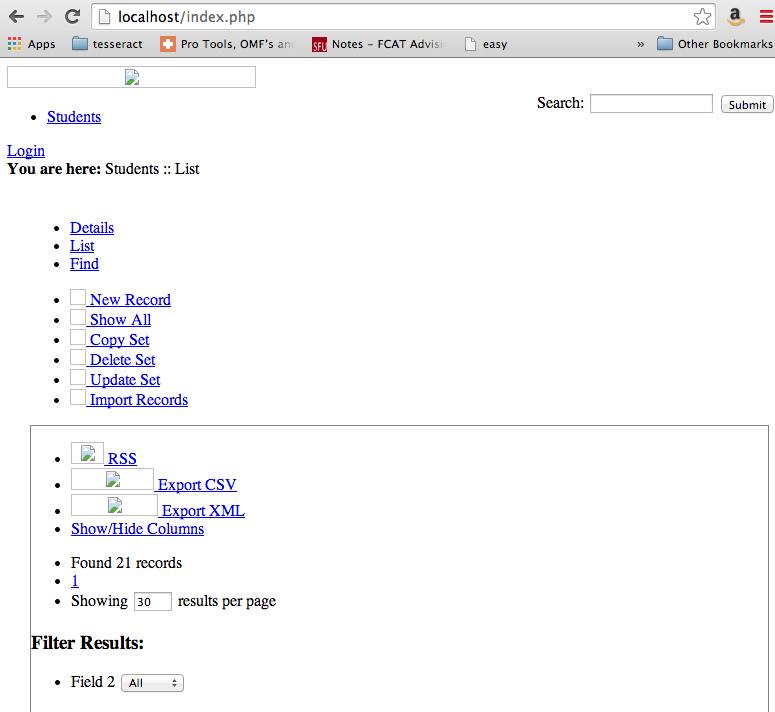 I can't find any log file for php. Xataface was downloaded on Saturday. When I try to run some other new php scripts php goes into a loop and I need to restart Apache. xataface scripts didn't do that. Only Date, Description and Comments work properly. You have spaces in your column names. Replace those with underscores. I've tried to create a new app (I've had an old xataface app runnig 5 years+ on the same server so don't think it's server config) but am getting the following errors. This happens whether I use the built-in installer or using the manual process. It gives me a few troubleshooting tips but none have helped fix it. Does the dataface__mtimes table exist? If it does, try deleting it. If it doesn't, that is strange... it should be able to create it. Make sure that the Xataface app has permission to create tables. WP land - $5/month WordPress hosting. Hey i want to install xataface but, after i go the create application for exesting database, nothing happend or i think the xataface doesn't run! Could you please help?